Quarterback/Defensive Back, Dohn Freeman was all over the field doing great things on Friday night for the Bulldogs. Bulldogs Win Round 2 of Playoffs, LONGVIEW, November 25, 2018 - The Corrigan-Camden Bulldogs won the second round of the high school playoffs on Friday night when the Dogs played the Winona Wildcats at Lobo Stadium in Longview (11/23/18). The dogs started out sluggish both offensively and defensively when the Wildcats scored in the first two minutes of the game on a 14 yard running play. When the dogs got the ball, they managed to drive downfield, but failed to get into the endzone, then had a field goal attempt blocked by the Wildcats. After that, the dogs got their stuff together and took over the game (especiall in the second half). On this night, Quarterback Dohn Freeman had a career game. Playing quarterback and defensive back, he seemed to usually be in the right place at the right time. Freeman would hand the ball off to Ashton Jones, and then block for Jones. He was taking the ball himself and running for long gains and touchdowns. On one play, Freeman threw a 45 yard rainbow of a bomb to to wide receiver Zack Ivie. Ivie caught the ball in stride in the endzone for a touchdown. The ball was placed so perfectly, that the defender didn't have any way to stop it. Ivie of course, made a great catch. I counted 2 fumbles that Freeman recovered for the Dogs. Freeman also was all over the place on defense making tackles. In all, Freeman scored four touchdowns, threw a touchdown pass, recovered 2 fumbles that led to Bulldog scores, blocked, tackled, and left it all out on the field. Just watch No. 3 for the Bulldogs on the highlight reel and you can see it all for yourself. As usual, running backs Ashton Jones and Terrell Cook ran hard for the dogs getting first downs and grounding and pounding the Wildcat defense into brokenness. The Bulldog defense was scored on, but they held when it was most clutch. Now the Dogs will be hosting the Daingerfield Tigers in Henderson on Friday night. This week's highlight reel, is as usual, brought to you by the great one, Willie A. Openshaw. He outdid himself again. Be sure to watch the reel to the very very end. The Willster dropped in one of his surprises. Head Coach, Seven Armstrong knows how to make the most of the small pool of talent that's available in the Corrigan-Camden District. Ashton Jones runs for yards. Jones gets excellent blocking from his teammates. The Bulldog running game wore down the Wildcat defense. Wide Receiver, Zack Ivie about to haul in a 45 yard bomb from Freeman for a Bulldog TD. Terrell Cook is escorted by a Bulldog convoy. Freeman always seemed to be in the right place at the right time. At times he seemed omni present. Freeman leaves a Wildcat defender in the dust enroute to another Bulldog TD. 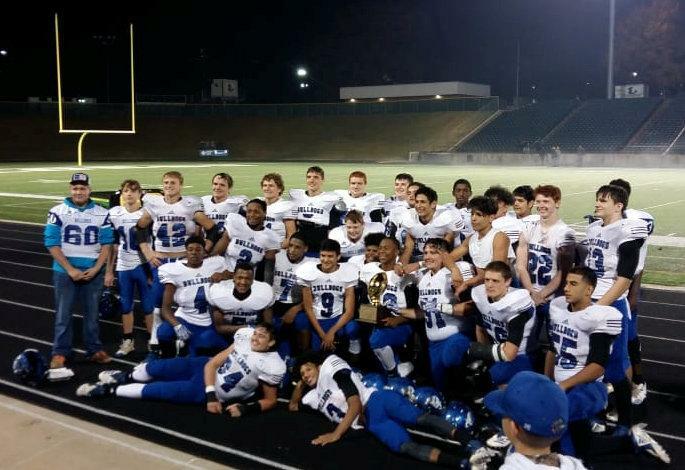 2018 Corrigan-Camden Bulldogs, Area Champions (Photo by Mely Lopez).